<300NT, 5 hearts, american, favorites, guting (古亭）, lunch, shida (師大), taipower (台電大樓), updated., western. While walking around Shida Night Market I noticed that the Shida location of Toasteria closed on June 04, 2012! Not to worry, they still have two other locations in Taipei. A good friend of mine found Toasteria Cafe and decided with our love of salads and paninis we had to try it. Toasteria is located inside of Shida Night Market (師大夜市) off of YunHe Street (雲和街). The cafe itself is really cute and open; go on a nice day and enjoy the open patio-like feel. The menu has a wide variety of grilled sandwiches, at least 20. 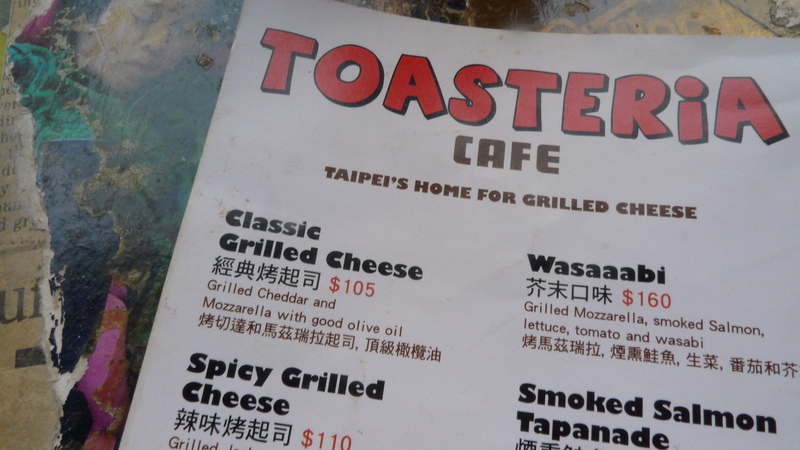 They boast proudly on their business card that they are “Taipei’s home for the grilled cheese”. While I don’t necessarily know if that’s true, they do make a pretty mean panini. The average sandwich ranges from about 100nt to 170nt and for an extra 70nt you can add fries and a drink (coke or grape fanta). My friend and I opted to share a sandwich, salad, and add the fries and a coke. 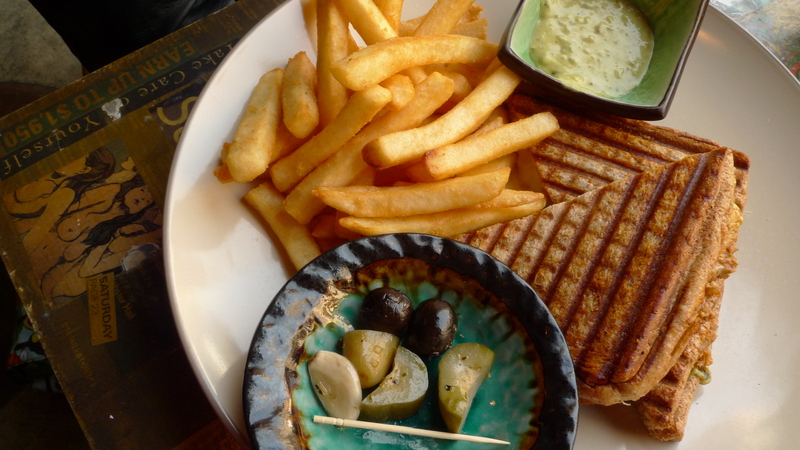 We finally decided on the Grilled Jack Chicken sandwich, grilled jack cheese, chicken, and caper aioli for 160NT. First off, the fries were really good. They were really cripsy without being hard or oily. I’m sure they came out of a bag from Costco or something, but still they were very good. The sandwich was great. There was a nice spicy kick to it from the jack cheese which I’m pretty sure was pepper jack. The chicken was also well seasoned and not dried out. Another awesome thing about this sandwich, the caper aioli sauce on the side, SO GOOD. We didn’t put it on the sandwich, instead we just dipped the fries in it. Highly recommended. For salad we had narrowed it down to either the Toasteria salad or the gouda salad. We decided to go for the gouda salad because both of us love cheese. Unfortunately the first salad that was brought out to us had a worm, like full on slug/worm, in it. We took it back to the counter and they apologized and made us a new one. Usually something like that would turn me off from a restaurant, but they were very apologetic, made us a brand new salad and gave it to us free of charge. Back home in the US you would expect this kind of service, but in Asia I’m more used to just picking certain things out and eating around it. So the free salad was a nice surprise. After that issue was taken care of, the salad itself was actually pretty good. The vinaigrette was some sort of balsamic red wine mix that was pretty good. Other then that there was three slices of gouda, red onions, watercress, and some toast. The salad is a little pricey considering its size, but in my opinion it’s pretty worth it considering how tough it is to find good salads in Taipei. 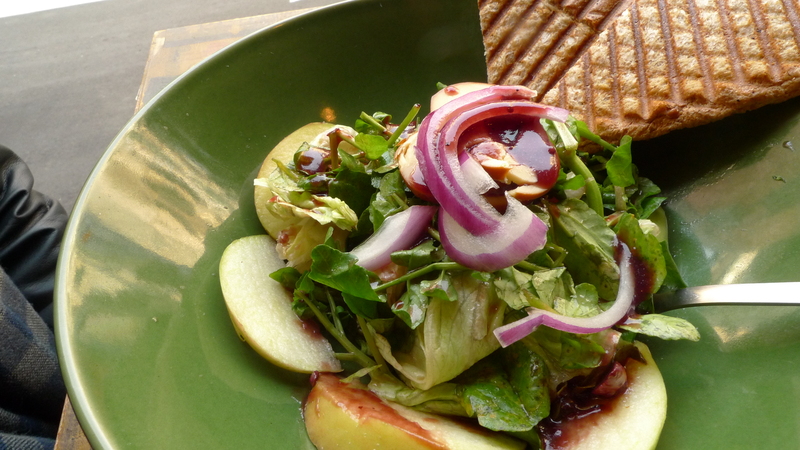 Overall, Toasteria is a great place to grab some lunch or maybe even dinner. There are definitely plenty more of the panini’s that I want to try and they have Stella Artois on TAP! I will definitely be going back for that. I read on the happy hour menu that all beers are 90NT during happy hour, so maybe I’ll go then. Also, they have buy one get one free margarita’s Monday and Tuesday according to the chalk board inside. I think next I’ll try the Spicy Grilled Cheese or the Eggplant one. <300NT, 4 hearts, american, dinner, western. I came here for the first time three years ago while studying abroad at National Taiwan University. At that time it had just opened and we were a bunch of hungry American exchange students that after almost a year couldn’t wait to get some American food into our stomachs. I must say, The Diner does the job. The Diner is located on Rui-An St. (瑞安街) off of Heping East Road (和平東路). The bus will drop you off less than 5 minutes from The Diner (get off at either 安東市場 or 龍門國中) which is right up Rei-An St. a few minutes. inside the diner (ground floor). I don’t know about the decor necessarily feeling “American”, but the menu for sure is. They have a lot of good options for breakfast, along with burgers, sandwiches and SALADS! My friend and I love salads and being in Taiwan makes us miss them. We decided that we’d split a salad and a burger, which ended up being the perfect serving size. We ended up with the spinach salad and BBQ burger while my boyfriend opted for the California burger. First thing that came was the salad. We both love spinach salad so it was the obvious choice for us and I we were not disappointed. The spinach was fresh, the croutons were crunchy, the vinaigrette was light and the bacon was delicious. My only complaint would be that the spinach needed to be cut up. The leaves were huge so it got a bit messy trying to eat it, but the taste was great. I’ll definitely be getting that again. The BBQ burger was tasty. I have to admit that the hamburger patty at California Grill was more moist though. Even so, the burger was great. I like that they put the lettuce, onion, tomato and pickles on the side so that you can chose what you put in and so that the lettuce doesn’t wilt. The BBQ sauce was nice and tangy and the cheese was cheesy. Their buns are also really good: moist and fluffy. The California burger was also good. The avocado was really good and even better in the burger. Like the BBQ burger, the hamburger patty was not as good as it could have been, but still overall the burger was good. Dan also opted to turn his burger into a combination meal. All burgers come with fries, but for 80NT more you can add a soup or salad and drink. Dan got the soup of the day, which turned out to be Minestrone and he said it was pretty good. Basically The Diner is good American food in Taipei. I’ve only had their burgers so far, but I am eager to try their breakfast foods. I saw a lot of it go by and it all looked good. I’ve also been craving buffalo wings lately which they have and I plan to try. There was a Bloody Mary on the menu too, which I am curious about. I love a good Bloody Mary, and my bar used to make a great one, so I’m curious about The Diner’s. Hm…maybe I’ll have to go for breakfast one weekend afternoon and order a nice Bloody Mary to wash it down.